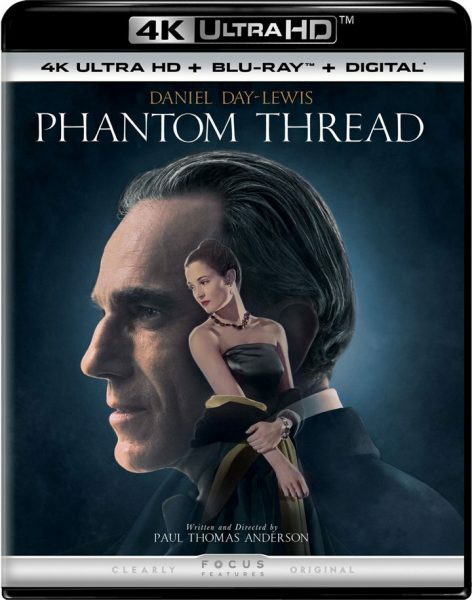 The romantic drama Phantom Thread starring Daniel Day Lewis was just released to Blu-ray and DVD on April 10, but the Oscar-winning drama will also soon be available on 4k Ultra HD Blu-ray starting May 8, 2018. The 4k Blu-ray release will feature DTS:X and DTS-HD Master Audio 7.1 soundtracks in English, as well as DTS 5.1 audio in Spanish and Canadian French. Video is presented in 2160p with HDR (High Dynamic Range) via the HDR10 specification. The two-disc combo edition (List: $37.99) from Universal Pictures/Focus Features includes an Ultra HD Blu-ray, Blu-ray and Digital copy for viewing on multiple screens. Extras include Camera Tests with audio commentary, For the Hungry Boy collection of deleted scenes, the fashion show “House of Woodcock” with narration, and ten minutes of behind the scenes content.